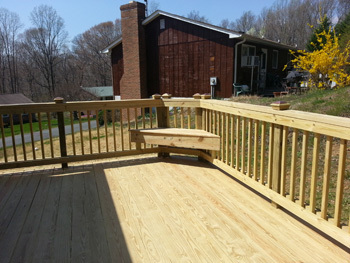 JJA Home Improvement is a Southern MD licensed home improvement contractor of new replacement maintenance free composite or treated wood decks. We operate in the St Marys County, Calvert County, Charles County and Prince Georges MD areas. St Marys County, Prince Georges County, Calvert County, Charles County, California, Hollywood, Lexington Park, Great Mills, Leonardtown, Chesapeake Beach, Sunderland, Clinton, St Leonard, Solomons, Huntingtown, Dunkirk, Owings, Charlotte Hall, Mechanicsville, Fort Washington, Accokeek, Temple Hills, Camp Springs, Brandywine, Waldorf, La Plata, Hughesville, Prince Frederick, and Lusby MD. 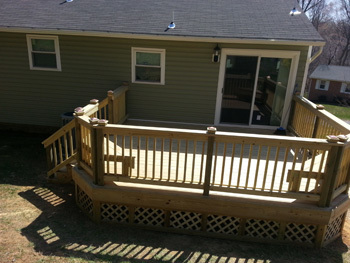 To schedule a FREE in home deck estimate, click here. 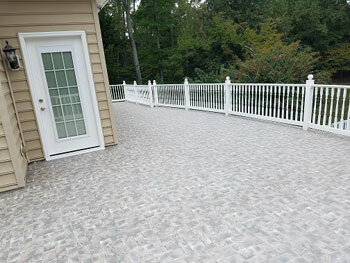 Dec-Tec provides all weather, slip resistant PVC membranes for decks, balconies, boathouses, walkways and stairs. This low maintenance decking option is anti-slip, waterproof, fire resistant and all weather ready.